Saturday February 12th 1881 It was a fearful day We did the work and kept ourselves as comfortable as possible. Mother and Lee did not get home tonight. The entertainment that was to have been in town tonight was postponed as the troupe could not get here. 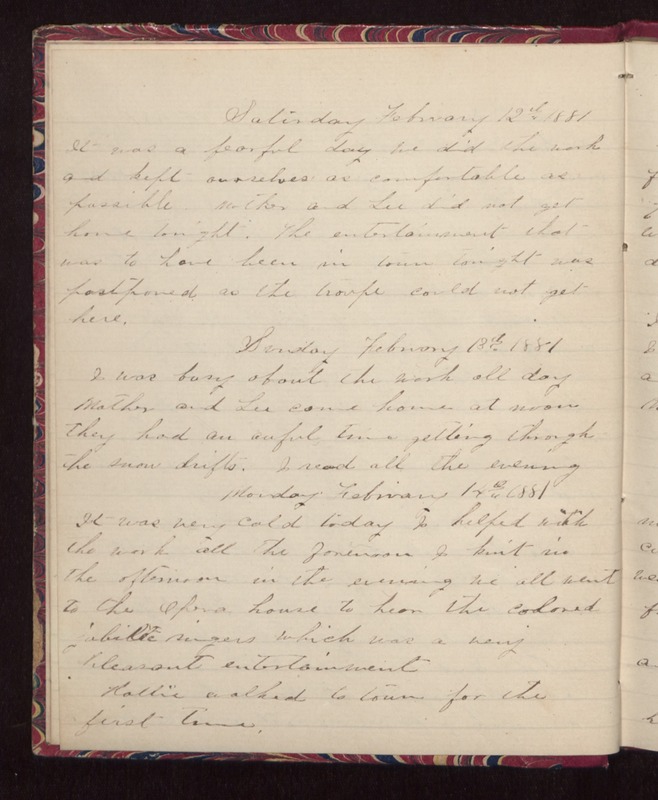 Sunday February 13th 1881 I was busy about the work all day Mother and Lee came home at noon They had an awful time getting through the snow drifts. I read all the evening Monday February 14th 1881 It was very cold today I helped with the work al the forenoon I knit in the afternoon in the evening we all went to the Opera house to hear the colored Jubilee singers which was a very pleasant entertainment Hattie walked to town for the first time.